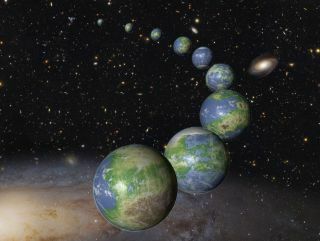 An artist's depiction of the many Earth-like planets that might exist over the course of the universe's history. The report, along with last month's similar survey of exoplanet research, will feed into two even more sweeping National Academies committee processes: two decadal surveys covering first astronomy and astrophysics, then planetary sciences. Once complete, those decadal surveys will govern NASA's decision-making about which projects and missions to pursue and how to prioritize them. In part, the report summarizes technological needs of the field over the next decades: To be successful, scientists will need incredibly powerful telescopes and starlight-blocking instruments that have yet to be built. But the report also touches on mindsets and research practices. Sherwood Lollar said that's what sets astrobiology apart from many other fields: an emphasis interdisciplinary thinking that pulls together a wide range of scientific specialties. The new recommendations reflect this, promoting systems-level thinking, the treatment of planets as a whole and looking at habitability as a spectrum, rather than as a simple yes-or-no question. "I think that it's heading in a really good direction," Sara Walker, an astrobiologist at Arizona State University not involved in the report, told Space.com. "You can't think about a planet as habitable or not." That change of thinking has come, in part, from discoveries about our own planet and how tenacious life here is. From deep-sea vents where microbes feast on chemicals to high in the harsh Atacama Desert to far below the ice of Antarctica, life keeps popping up where scientists had thought conditions were too forbidding. These finds prove that what's uninhabitable for one type of life is perfectly cozy for others. The report also emphasizes a key challenge to identifying life: accurately finding and interpreting what scientists call biosignatures, the chemical changes characteristic of life. That's not as straightforward as it sounds, astrobiologists know. Particularly in foreign solar systems, it's difficult even to spot potential biosignatures, and the universe doesn't come equipped with giant flashing arrows pointing to life. "It was just really frustrating and scientifically unsupportable to say that a particular piece of research was not part of the astrobiology picture," Jill Tarter, a retired astrobiologist at the independent nonprofit SETI Institute who wasn't on the committee, told Space.com. "At least it's now legitimate and discussed as part of the whole astrobiology umbrella suite of investigations." All told, Walker said that she was pleased to see the report reflect how dynamically the field is maturing. "It's actually moving to being a real science and not just an idea, and this document, I think, really reflects that," Walker said.